This index by Henry Farrar, published in two volumes in 1897, details all the marriage entries in Walker's Hibernian Magazine 1771-1812. There are over 12,000 marriages recorded from a time when few other records of this nature survive. As a consequence it is of exceptional genealogical value, recording the names, addresses and some occupations of the couples, and often the names and details of their parents (principally the fathers of the brides). 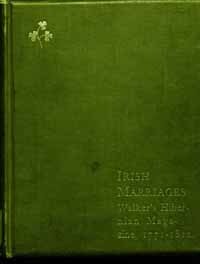 The dates and places of marriage are also recorded, and occasionally a lot of additional detail for selected marriages. We estimate that around 20,000 names are included in this source. The two volumes also include an Appendix by Sir Arthur Vicars of the births, deaths and marriages recorded in the short-lived magazine Anthologia Hibernica 1793-94. There are around 1,350 records in this section. In total we estimate that the books contain over 22,000 names across 547 pages. The majority of the information is derived from "The Hibernian magazine: or compendium of entertaining knowledge", a monthly magazine established in 1771 until it ceased in 1812. It was the main general Dublin journal for this period and covered many topics, from news and current affairs to fashion and the arts. As a consequence it was the main publication for the announcement of marriages. Even though I have unlimited access to the research library , I keep getting the message "Access denied . Am I doing something wrong ? Hadden Kemp . (one year subscription) . Thank you very much for your reply . I appreciate your help . Access to the library appears to be working now , but I will let you if there are any further problems .